Chicken Licken’ Good is coming up right now! This dish is of Palestinian origins, and it struck me it would be a perfect one to share, in a relaxed manner, with family and friends. It looks and sounds incredibly tasty, so see what you think. 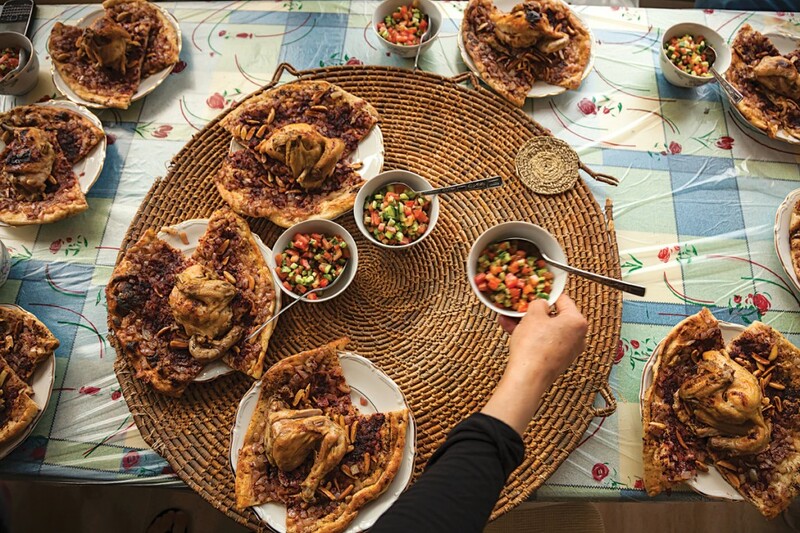 This dish first appeared in Saveur magazine alongside and article by Nancy Harmon Jenkins entitled the Heart of Palestine. Tart sumac balances sweet, caramelised onions in a roast chicken and flatbread dish, traditionally baked in a wood-fired oven called a Taboon. It looks and sounds a brilliant dish for sharing with family and friends, and the long prep time is to prepare the dough for the flatbreads. I love the cuisine of North Africa, and the Lebanon and Palestine - spicy but with that touch of sweetness that I enjoy. Serve this with dishes of chopped up ripe tomatoes, peppers, cucumbers to give it a freshness alongside the spices. Whisk flour and salt in a bowl. Combine water, sugar and yeast in the bowl of a stand mixer fitted with a hook. Let sit until foamy, about 10 minutes. With the motor running slowly add flour mixture and mix until dough forms, about 3 - 4 minutes. Cover with cling film (plastic wrap). Set in a warm place until double in size, about 1 hour. Divide dough into 2 balls. Transfer to a lightly greased baking sheet and cover with a damp towel and set aside 45 minutes. Toss quartered chicken with enough oil to coat both sides, 3 tbsp sumac, half tbsp of allspice and cinnamon, one third of the onions plus salt and pepper in a bowl. Massage into chicken really well, all over. Set aside for 20 minutes. Heat oven to 200 F/ 220C/ Gas 7. Heat a 12" heatproof skillet or frypan over a medium high heat. Season chicken with more salt and pepper. Cook, flipping over once until browned, about 6 - 8 minutes. Arrange skin side up, and add stock. Bake until chicken is thoroughly cooked, about 25 - 30 minutes. Transfer chicken to a plate and keep warm. Transfer pan drippings to a bowl and set aside. Add remaining oil to skillet. Place over a medium heat. Add remaining minced onions and cook until golden for about 25 - 30 minutes. Stir in remaining sumac, allspice and cinnamon plug salt and pepper. Transfer to a serving bowl. Wipe skillet clean and melt butter over medium-high heat. Add almonds and cook until golden - take care they only take about 3 - 5 minutes. Increase the oven to 220 F / 240C/ Gas 8. Working with 1 ball of dough at a time, roll into a 10" disk about 1/8" thick. Transfer to a parchment paper-lined baking sheet. Brush dough with a reserved pan drippings and spread half the onion mixture over dough, leaving a 1/2" border. Bake until bread is puffed and golden brown, 8 - 10 minutes. To serve, cut bread into wedges and place on 4 plates. Arrange chicken over flatbread, sprinkle with almonds and drizzle with any remaining pan juices. Hope your enjoy your Chicken Licken’ Good dish. Sometimes all you want is Chicken, in some form or other, but although this looks very exotic, it’s the flatbreads that take that bit of time to prepare and prove, but they’re worth it. This is a dish that both Erik and I will have a go at this weekend – he’s a dab hand at breadmaking, and with our fabulous new oven (more about that in another post) he is baking brilliant bread for us almost every day. The chicken side of the dish will be down to me, and I’m really looking forward to the spices floating around in our kitchen when I’m preparing this M’sakhan. Who knows, if the weather holds out, we may even light up the barbie, but I think it would taste incredible to cook both the flatbread and the chicken in my Wood-Fired oven. Will let you know how it turns out. But one things for sure, I think we will be eating like kings (and queens). Avocado for Breakfast? Smile your way to health!